They say a change is as good as a rest. Try telling that to Brian Young. The boss of Molson Young Plant Sales, Scotland’s most successful multi-franchise dealer, has just reached the end of a whirlwind 12 months during which he sold the business, prepared for the imminent departure into retirement of his right-hand man, recruited a new sales team, added yet another high-profile franchise to the portfolio and regained distribution rights to two others. Not enough? 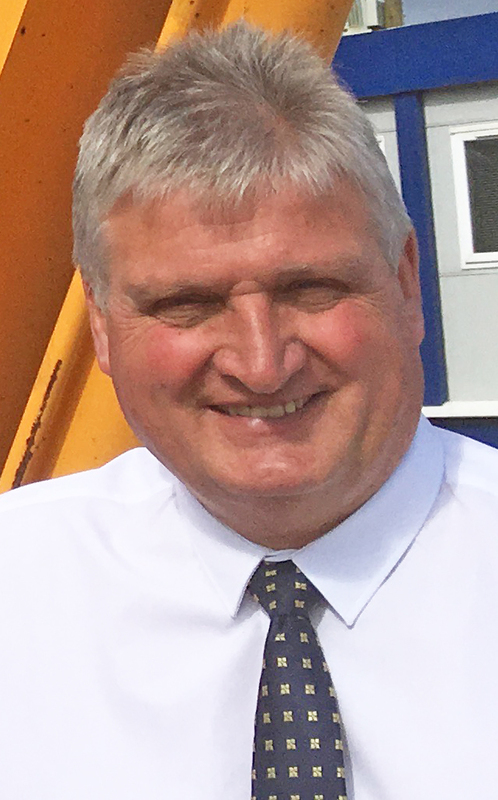 Well he’s expanded the Doune headquarters via the acquisition of three workshops and extra yard space, has plans to open a depot in the north and has just welcomed his son Joe as the third generation of the family business. Brian Young (left) with Bob Lyttle: A 17-year partnership is coming to an end. There was common ground between the two: Like Molson Young Plant, Molson is a multi-franchise operation and a Hyundai dealer (the biggest in Europe). It’s also the largest Kobelco dealer in Europe and it made sense to have Young handle that brand north of the border, an arrangement that was rubber-stamped by Kobelco executives after visiting Young’s headquarters. However, before that could happen, Brian and sales director Bob Lyttle had to convince the manufacturers they were already representing – especially those with products competing against Molton’s franchises – that the acquisition would not affect their interests. Significantly, all agreed to place their trust in the status quo. 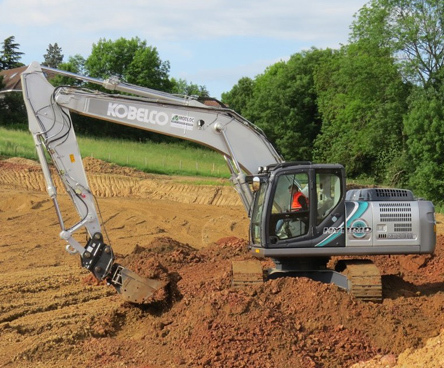 Kobelco has now joined the line-up. 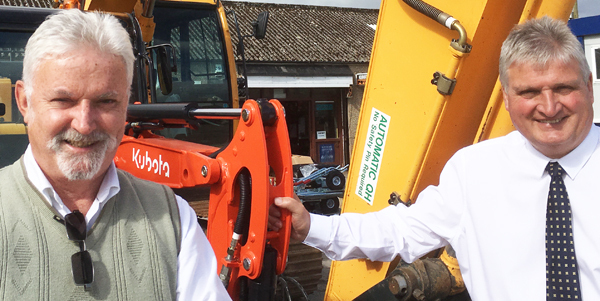 On other franchises, the past year has seen Molson Young Plant reconnect with two manufacturers it previously represented; Italian telehandler firm Dieci (YPS will handle the construction range) and Thwaites dumpers (back home in the Young yard after a number of years being distributed by Stewart Plant Sales. 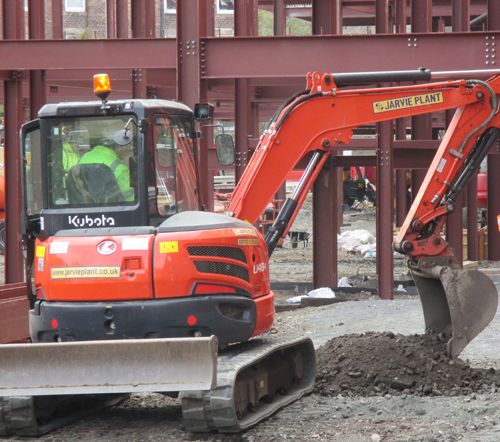 The Kubota statistics over the last four decades are impressive: Molson Young Plant has supplied around 8,000 new machines since becoming the main dealer in 1979 and is the longest serving mini excavator dealer in the UK. It has been the largest supplier of minis worldwide on five occasions. Equipment and premises apart, there has also been the not inconsequential matter of Bob Lyttle’s retirement to be addressed (see story below). A plant industry veteran, Lyttle joined forces with Brian 17 years ago, the partnership sealed at a meeting in the salubrious surroundings of a Little Chef restaurant, and has made what Brian acknowledges as a “huge” contribution to the business. Together, the pair have steered the business through major expansion, culminating in the most recent five-year plan that targeted, and achieved, 15% growth per annum in spite of very difficult trading conditions. Andy Wilson, Gordon Greenall and Celia Norton. Inset, Christina Neil. To help fill the void left by Lyttle’s departure, Celia Norton was recently recruited as sales and business development manager. She brings extensive global experience of selling and marketing industrial equipment. She’s been joined by Christina Neil who has sales experience with a number of manufacturers and dealers and is also a qualified plant operator. 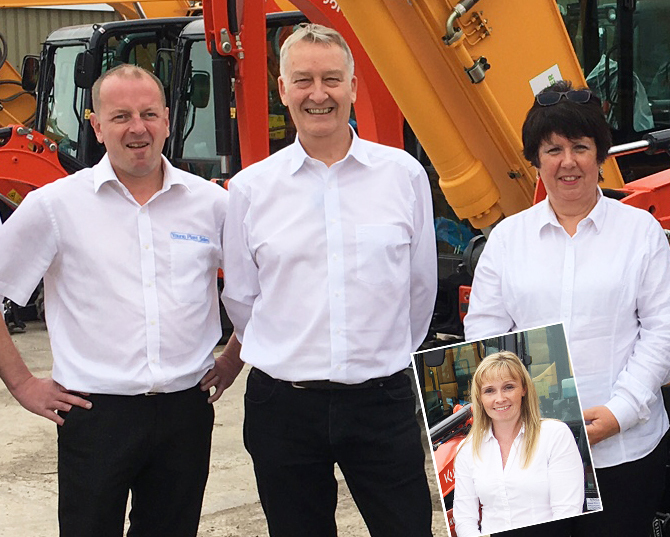 Christina is responsible for heavyline sales of the Hyundai and Kobelco products in central and southern Scotland, sharing that role with Gordon Greenall. Andy Wilson continues to handle light equipment sales in the west of Scotland. Reinforcing the family connection is Brian’s son Joe, (21), who has worked in the workshop and parts department over the last five summers. He’s just completed a degree in chemistry at Heriot-Watt University but, given a choice of continuing in education for another year to gain an honours degree or to enter the equipment industry full time, has plumped for a plant career. It’s a situation Brian can relate to; he’d earned a degree in zoology before joining his father and company founder Tom back in the late ‘70s. Daughter Natalie, (19), has also expressed some interest in continuing the family line. She’s at Glasgow Caledonian University doing media studies and has worked with her father during holidays. “It’s not beyond the realms of possibility that she might enter the business at some point on the marketing side of the business,” says Brian. No other franchise is allowed to compete with Kubota. There’s also a landmark year to look forward to: 2018 will mark his 60th birthday, his 25th wedding anniversary and Molson Young Plant’s 40th year in business. And there are new premises to be acquired in the north to improve after sales support and to give better access to stock for the northern sales managers. It looks like Brian Young will have to wait a few more years for that rest. As this latest chapter in the Molson Young Plant history nears completion it also marks the departure of sales director and in-house joker Bob Lyttle. He’s been with Molson Young Plant for 17 years, a partnership that was sealed in a Little Chef roadside restaurant. “I remember that meeting well,” recalled Bob. “The vision Brian had for the company at that time was easy to buy into and things have worked out better than even we imagined. At that time the business was turning over around £3.5m a year. Last year it was £15m. Lyttle has made a huge contribution to the success of Molson Young Plant. “It’s been a great business to be in for the last 40-odd years. I’ve seen places I wouldn’t have seen otherwise and I’ve worked with some real plant professionals over the years, people like Gavin Shanks [North British Tractors], Stevie Bryant [Scot-JCB], Marshall Rankin [Reekie Komatsu], and Brian himself. You learn a bit from each. I’ve been very fortunate over the years to have made many good friends who started out as customers and hopefully those friendships will continue after my retirement. Brian acknowledges Lyttle’s huge contribution to the company. “He’s brought professionalism, loyal customers and his humour. Business is usually quite light-hearted with Bob and customers appreciate that. There are no easy deals. Margins are tight and negotiations can sometimes be tense so being able to have a few laughs is very important. It’s great for morale here in the office as well.